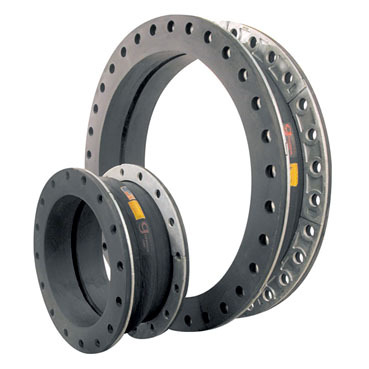 General Rubber’s Maxi-Joint brand represents our state-of-the-art line of rubber expansion joints, flexible connectors, rubber flanged hoses and accessories, as well as spray shields and penetration seals. Since our inception in 1950, General Rubber has designed and developed a wide range of performance products used in the most demanding applications. Improved performance and engineered solutions are accomplished by incorporating advanced materials of construction and technologies to what otherwise would be considered a conventional product line. Piping and ducting systems require support and flexibility as critical design elements to ensure continuous and safe operation. The features and benefits of our performance expansion joint designs will achieve these critical elements by absorbing system forces and displacements, replacing them with the expansion joint’s low stiffness (spring rate). Additionally, they are designed to reduce noise and vibration, have a cycle life in the tens of millions, compensate for misalignments, provide access to piping and equipment, and relieve pipe and anchor stresses. The selection and application of General Rubber’s unrestrained expansion joints represent the most cost-effective arrangement when they are used in rigid piping systems with main anchors and numerous guides at specific spacing. The selection and application of General Rubber’s advanced restrained expansion joints can be used to provide system flexibility while restraining pressure thrust forces and other external loads. This approach allows for an optimal design with a smaller footprint. The economic benefits of using advanced restrained expansion joints also include—but are not limited to—fewer guides, anchors and supports.